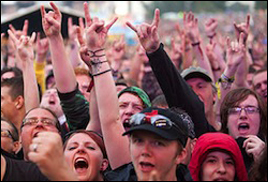 LONDON (VIP NEWS) — The organizers of Sonisphere say the rock festival has been cancelled for 2013. The event, which was due to take place at Knebworth Park, was only confirmed a few weeks ago. Organizers say they were unable to secure a strong enough line-up of artists, and will now take a year off. "We made offers to over a dozen major artists but for various reasons none of these offers lead to securing a strong bill," they said. The festival was also cancelled in 2012, which Stuart Galbraith, CEO of Kilimanjaro Live said was a "hiccup". Adding to their statement about the 2013 cancellation, organisers said they were unwilling to go ahead with a festival they were not satisfied with. The statement, on the event's Facebook page, said: "The three Sonisphere festivals to date set a very high standard and indeed 2011 was voted the best festival line up by The UK Festival Awards. "We think it is really important that the event only runs when it has a line up that sets it apart from the competition whilst also carrying a ticket price that allows us to offer real value for money to the music fans. "We were hoping to do that in 2013 but unfortunately it wasn't possible to fulfil both aims with the principle problem of there being a lack of available headliners of the calibre of previous festivals at Knebworth." Organizers are still looking to being the festival back to the UK in the future. "We have already started work on Sonisphere UK 2014 so hope to be able to bring you news about that later next year," they said. The festival will still go ahead in Italy and France in June 2013.